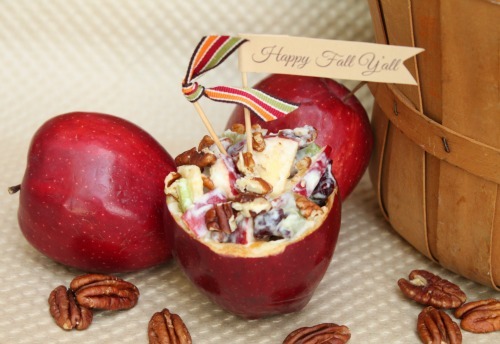 Rebekah made a delicious salad even more appealing with these fun DIY apple bowls. These would be so fun to serve all sorts of Fall recipes in, from apple sauce to yummy apple desserts. You can check out how to make apple bowls and get her yummy Waldorf salad recipe over at A Blissful Nest. How cute! I made up a wonderful cinmamon-yogurt apple salad that would go great in these apple bowls!